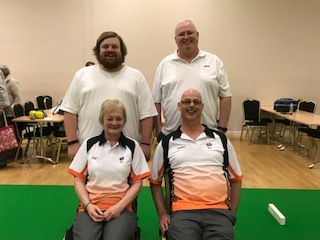 FOE trio Carol and Bob Taylor with Tony Ealham came runners up, losing 2-1 in a 3 end play off at Each Anglian Children’s Hospices Charity event at Stowmarket. They won there 4 group games convincingly to top the group to reach the final but the real winner was the charity which £750 was raised for. 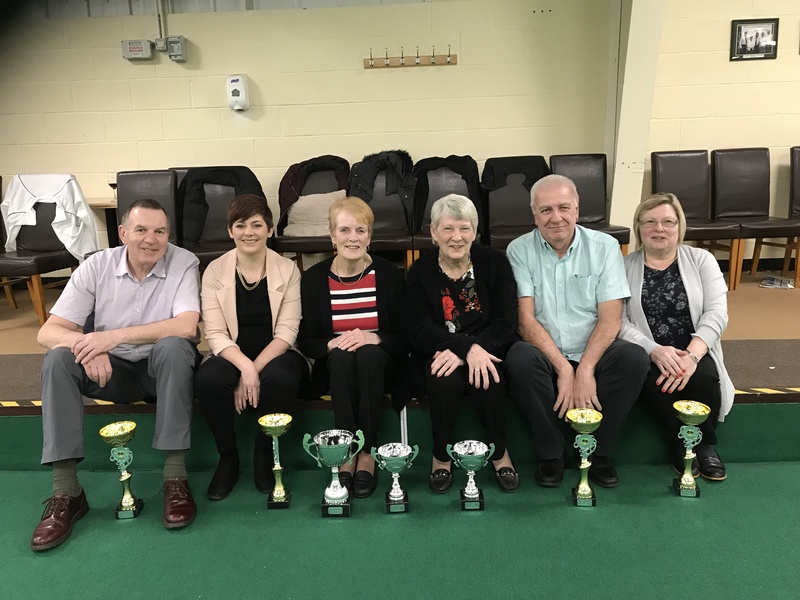 The winners at the front from L to R are Pat Goodchild, Pauline Child, Eileen Smith-Allen and Tony Ealham. 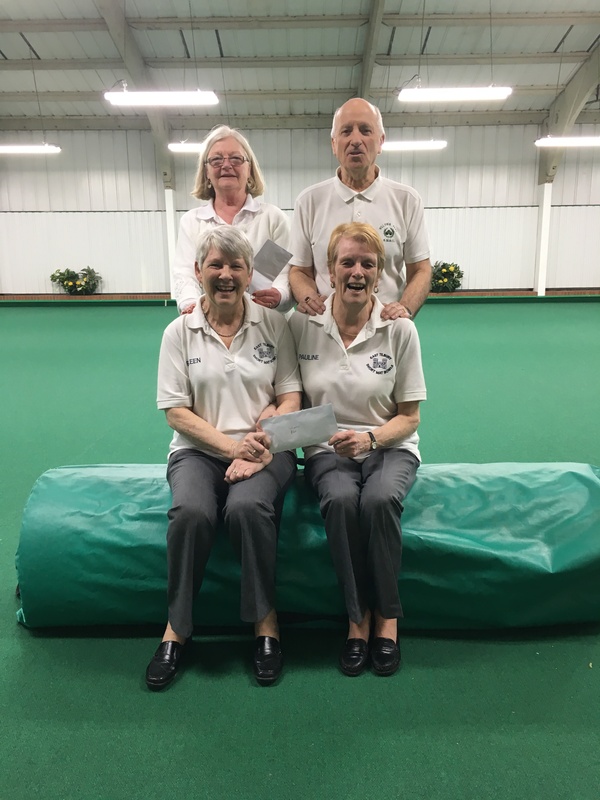 The runners up frpm Suffolk were Bob Cousins, Margaret Hastings, Joanne Clements and Derek Adams. To get a full report and list of results please go to the relevant page. 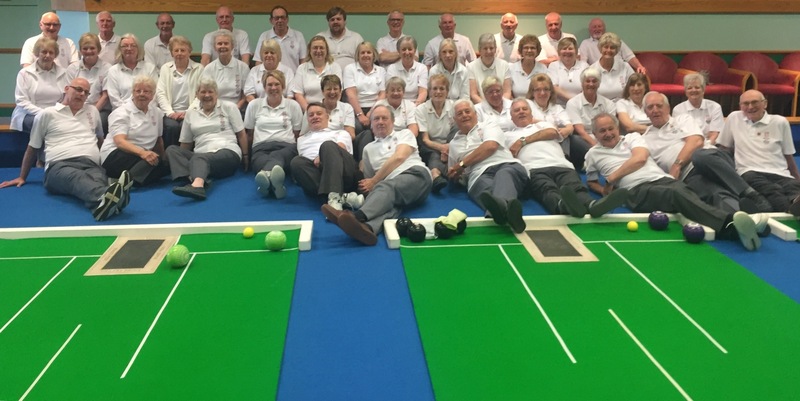 Forty two players went on tour to Dorset for a good weekend of bowling. A good weekend was had by all but as usual we came away as losers with a score line of 149-191. Peter Debenham was the player of the weekend with 90 percent. The trip was a success with full of laughs and stories despite the result. To get a full list of results please click on the link below. There is also a tab on this spreadsheet for individual scores. 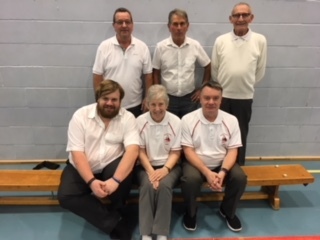 Friends of Essex are proud to announce a sponsorship deal with Eight Wealth Management Ltd. A welcome speech and presentation by a David Shepherd will be held at Falcon Indoor Bowls club on Wednesday 18th April at 6:30 pm before bowls takes place at 7:30 where everyone will be welcome to bowl. Posters regarding this will be handed out at the 3 wood pairs competition at Marconi on Sunday 18th March and would appreciate if as many of you could attend this presentation. There will be no obligation at this presentation but it is being held as part of the sponsorship deal. 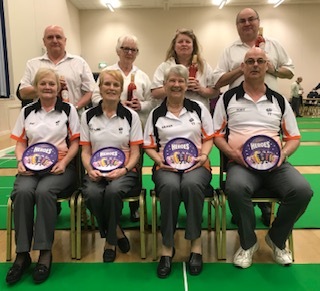 Sixteen teams took part in the above fours competition where each team had 4 games with 10 points for a win, one for a draw and a point for each end won. Friends of Essex was represented by Carol and John Finn together with Colin Addis and Peggy May. Out of their 3 games they did extremely well by winning 3 of them and gained a total of 55 points to finish in 4th position. 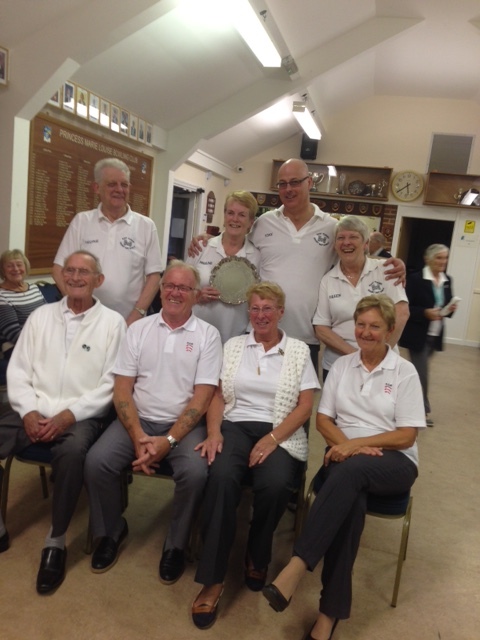 The winners were East Tilbury who finished on 65 points with the runners up Ramsden Bellhouse finishing on 61 points. The winners at the front from L to R were Mark Chittock, Andy Philbrick and Dave Chittock. The runners up at the back were Alan Jones, Roger Dover and John Bellett. To get a full report on the days results please go to the relevant page. The above competition was held at PML where 16 teams took part. Each team played 4 games of 9 ends with 10 points for a win, 5 for a draw plus a point for each end won. FOE was represented by Carol and John Finn with Peggy May and Colin Addis. In their first game they deservedly beat Stonyhill 9-6. Their second game was very close but just lost out to Heron Park 4-8. In their third game they was again on the wrong side of a tight game, losing out to Outwood Common 4-7. They got back to winning ways in their final game by beating South Benfleet 13-7. They eventually finished in 9th position with a total of 37 points. The winners of the competition were East Tilbury with Stonyhill finishing up in runners up spot. A more detailed report can be found on the Stonyhill website but to view the final table please click on the link below. The funeral of John May will be at Bentley Crematorium, Ongar Road, CM15 9RZ on Wednesday 30th August at 3pm. The wake will be at Ashwells Sports and Country Club, Bentley, Brentwood, CM15 9SE. Everyone is welcome. You can have the choice of sending flowers or making a donation. There will be a donation box inside the crematorium for ‘Parkinsons’. Arrangements for the tour to Dorset in May 2018 have now been finalised. Letters of invites will be handed out at the Kent and Norfolk match. If anyone wishes to go on the reserve list please let me know. Also dates and competitions for 2018 have now been released. Please go to the Diary page to get these but further details of the competitions will be issued shortly. FOE finally got a victory against Norfolk at Falcon on Sunday 11th June 2017. To get a full report and scores please go to the relevant page. Just like to point out this is not FOE first ever victory. We have beaten Norfolk and Kent before at home. Its just on the road we cant manage a win. 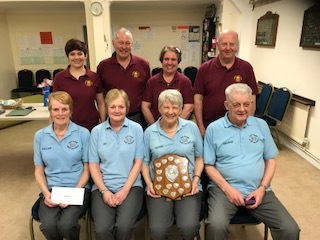 The winners at the front for the second consecutive year and who received £100 are Eileen Smith-Allen, Pauline Child, Tony Ealham, Andy Philbrick and Pat Goodchild. 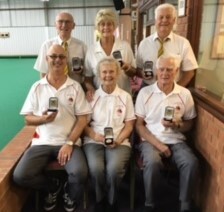 The runners up at the rear who received £50 are Dave Chittock, Pauline Pammant, Tony Miles, Mark Chittock and Val Miles. To get a full report and list of results please go to the relevant page. I have made arrangements with the manager of the golf club at Stonyhill to be able to leave our cars in their car park for the 4 days we are in Torquay. The space we are being given is 2 bays in from where we normally park. More details will be given in the itinerary. 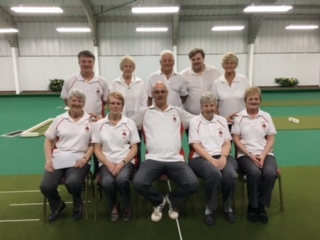 Due to unforeseen circumstances Stonyhill Indoor Bowls Club will be closing as from 1st May 2017. New venues have been arranged for matches and competitions after this date. The competitions scheduled for 19th March, 29th and 30th April will still be held at Stonyhill. Those going to Torquay Stonyhill have said we can still leave our cars there but I’m trying to find out if any staff will be there during this time. If not it will play on my mind the safety of the cars left are at risk and I will arrange for the pick up at Falcon. 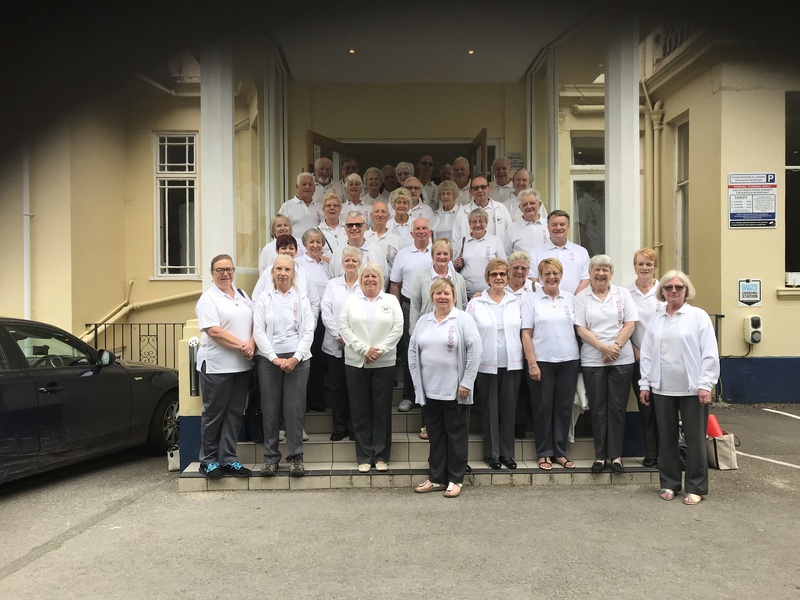 I will try to let you know as quick as possible on this especially those that have booked into the Travel Lodge at the Half Way House the night before departure to Torquay. I apologise for any inconvenience caused but it is totally out of my hands and against my wishes. I WOULD LIKE TO WISH EVERYONE A HAPPY NEW YEAR AND MAY IT BE A HEALTHY AND SUCCESSFUL 2017 TO YOU ALL. The Friends of Essex Diary has now been updated with 2 new dates added for next year. These are an Open Fours Charity Comp on Sunday 20th August 2017. The charity will be British Heart Foundation. 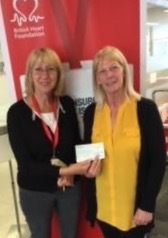 This is a charity I have strong connections to and great admiration for. 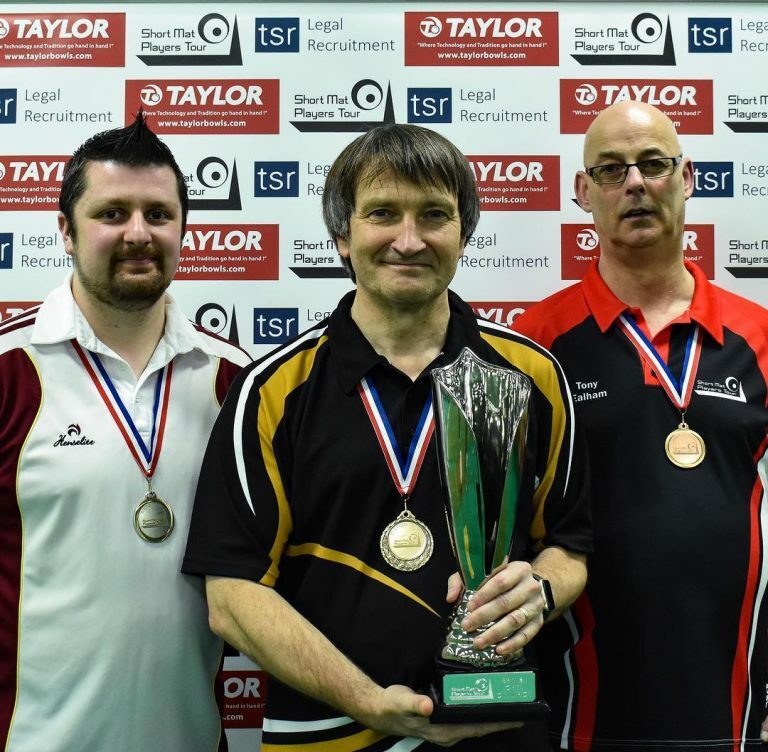 The other is an Open Triples Comp on Sunday 19th November 2017. To get further details please go to the Diary page and if anyone wishes to take part in any of the events on the Diary could they please get in touch with me. I am also taking a reserve list for any of the events that are full at present. The winners are seated from L to R, Mark Chittock, Brenda Neil, Dave Chittock. The runners up at the back from L to R are Pat ‘Dressage’ High, Alan High and Peggy May. 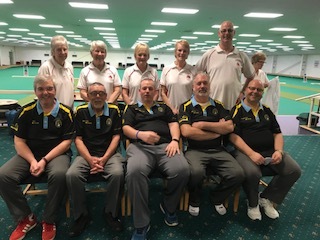 Twenty six teams took part in the above competition and a good days bowling was had by all. A tremendous raffle was well supported. To get a full list of results please go to the relevant page. The above competition was held at PML where 16 teams took part. 10pts were awarded for a win together with a point for each end won. Friends of Essex were represented by Andy Philbrick, Dave Chittock, Jonathan East and Mark Chittock. In their opening game they beat Heron Park 10-5 and with ends won gained 15pts. In their second game they lost to Courage 5-7 but won 4 ends giving them 4pts. 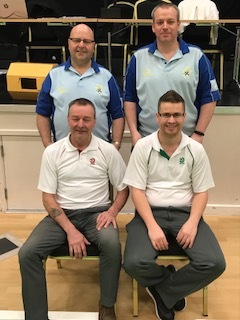 They then won their remaining 2 games 17-2 against 3 Degrees and winning 7 of the 9 ends giving them a big score 17pts bringing them into the running for the competition. 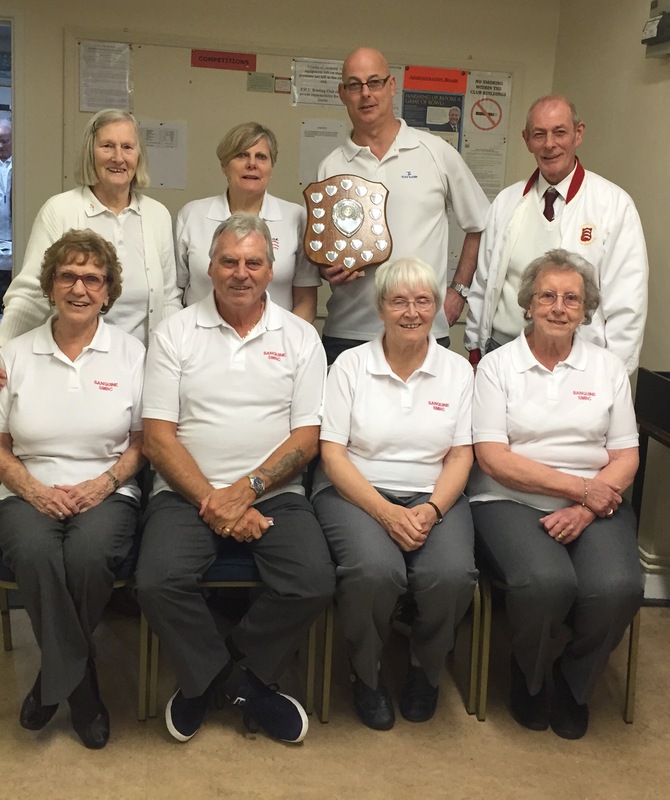 Their last game was won 13-5 against Canvey and with 6 ends won giving them another big score of 16pts. This gave them a grand total of 51pts. 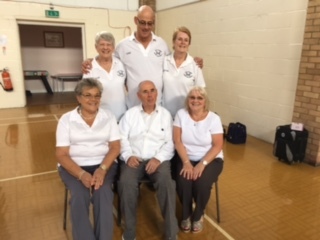 East Tilbury was represented by Lyn Munns, Eileen Smith-Allen, Tony Ealham and Pauline Child. Their first game against Sanguine gave them a victory 11-6 and with 5 ends won they scored 15pts. Their second game was a convincing win against Heron Park 14-3, winning 5 ends. 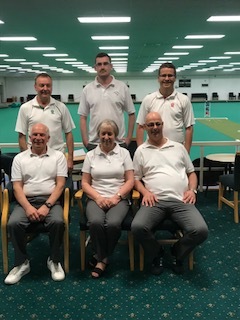 Their next game was very tight against Courage and with 2 ends to go were 6-3 behind but with a 3 and a 2 eventually ran out 8-6 winners scoring another 15pts. With all to play for in their last game against Springhouse a victory would give them the trophy. In a close game they won 8-3 and 6 ends giving them 16pts. This gave them a grand total of 61pts and tournament winners. Outwood Common also score 51pts but with a greater shot difference Friends of Essex finished in runners up spot. The winners are seated from L to R, Tony, Sylvia and Tom Ealham. 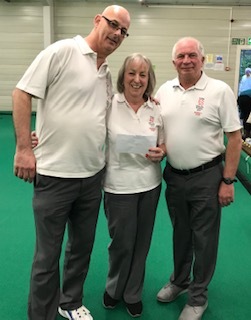 The Runners up at the back from L to R are Bryan Pudney, Val and Tony Miles. 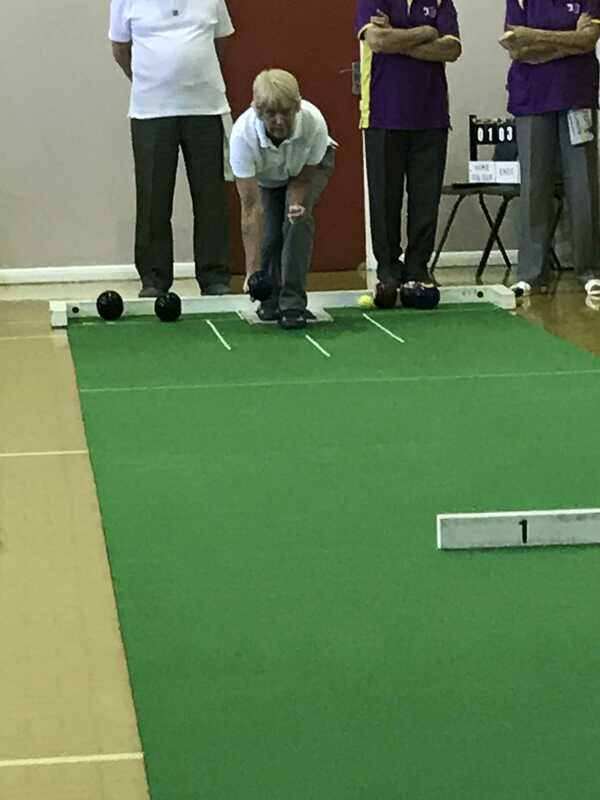 Twenty teams took part in the above competition and a good days bowling was had by all. A tremendous raffle was well supported. To get a full list of results please go to the relevant page. FOE visited Snodland for the 2nd leg of their annual match against Kent Invicta. After the 1st leg at Marconi a few weeks earlier FOE were 36 points behind. The format was the same of each team having 12 triples played over 8 sessions with each triple having 4 matches. FOE put up a tremendous and spirited fight to overturn the deficit. Of the 8 sessions played FOE only lost one and a comeback looked on. 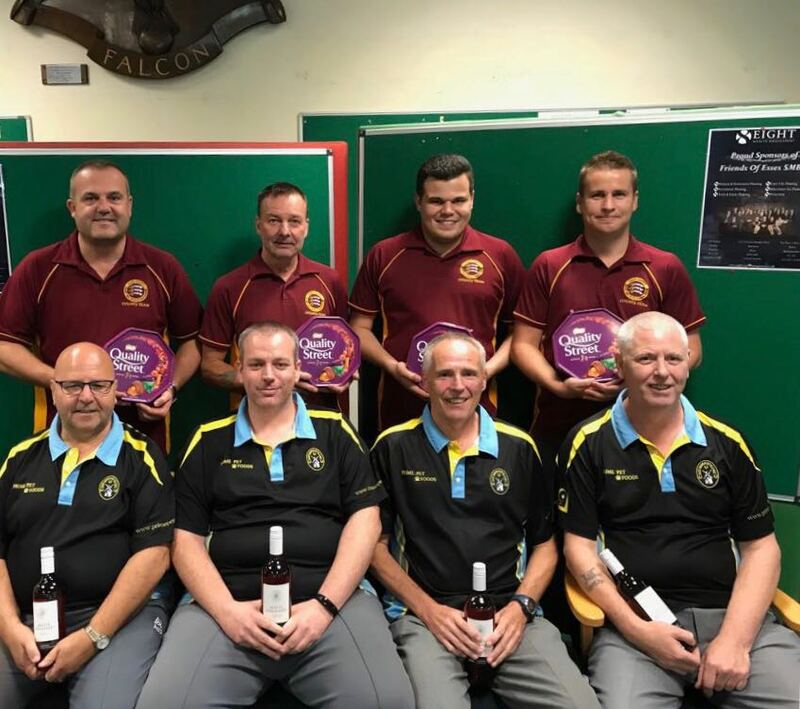 On the day FOE were eventual winners 61pts to 35 and winning the shots 356 to 291. This left an aggregate score of 113 pts to 103 in favour of Kent. I could not ask for more from anyone as everyone played their part in this amazing comeback and am proud of you all. 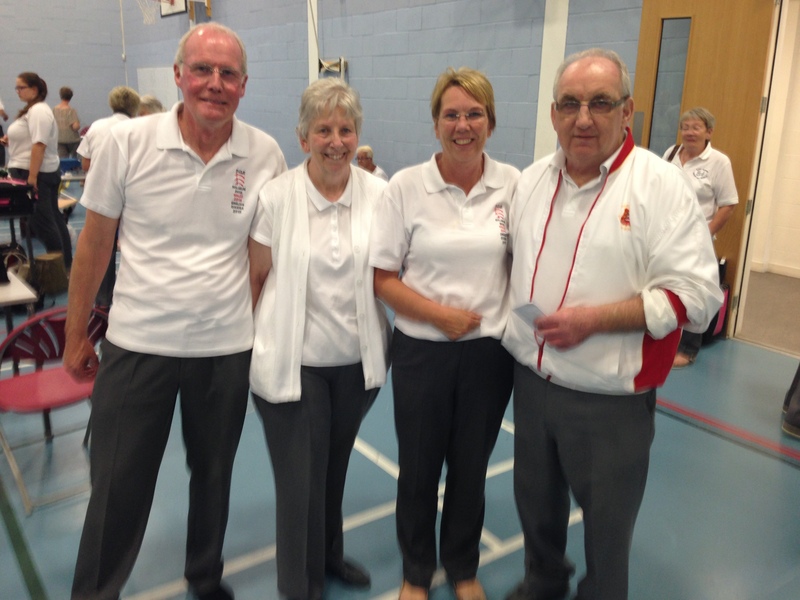 The triple of Eileen Bellett, John Bellett and Dave Chittock scored a hot shot of 6. 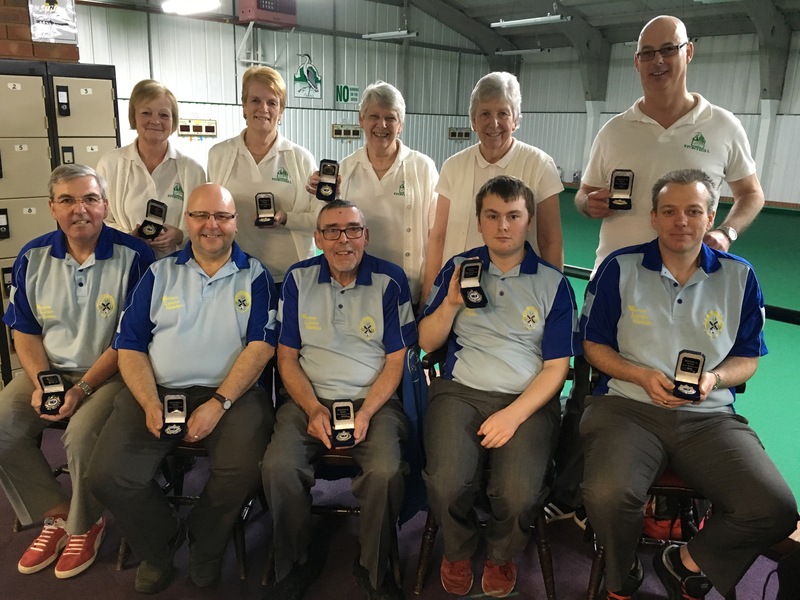 Three teams won all of their games but on shot difference Heather Clements, Andy Philbrick and Bart Clements were team of the day. Well done and congratulations to all 36 players. To get a full list of results and individual scores please go to the relevant page. FOE face an uphill task in the second leg of their match against Kent Invicta after losing at home in the first leg at Marconi. Despite two teams getting a hot shot during the day which were Alan High, Tony Hayes and Tony Ealham. The other team to score a six in a field of all triples matches were Joan Wade, Tony Slater and John Wade. Each team had twelve triples playing five games. 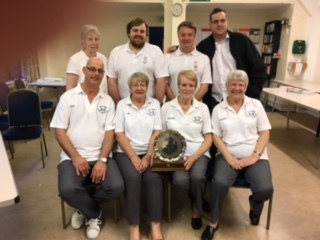 At the end of the day Kent Invicta gained a 78 points to 42pts lead to take into the second leg on 6th August making them strong favourites to retain the annual trophy. The shots were 484 to 399 in favour of Kent. 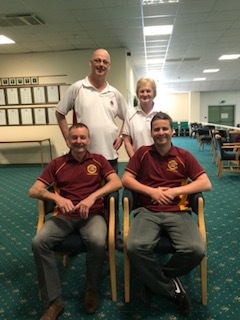 The team of the day were Sheila Booker, Roger Booker and Mark Chittock who gained 8 points from a possible 10. A good days bowling was had by all with excellent support for the raffle. Even though FOE are behind by 36pts I believe we can still come back and win it. It would be a better comeback than Bobby Ewing and Dirty Den !!!!!!!! To get a full list of results and teams individual scores please go to the relevant page. The above competition was held at PML where 16 teams entered. Friends of Essex was represented by Peggy May, Edna Burridge, Stewart Blackhall and Tony Ealham. The format was each team played 4 games where it was 10 points for a win, 5 for a draw and a point for each end won. In their first game they came across Stonyhill (Heather Clements, Carol Finn, Bart Clements and John Finn). 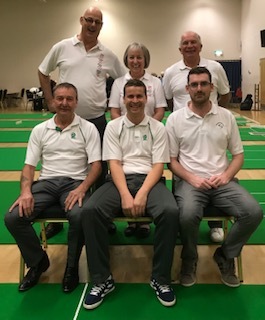 After 3 ends FOE found themselves 7-1 down but won the next 6 to win 10-7 and collect 17 points. 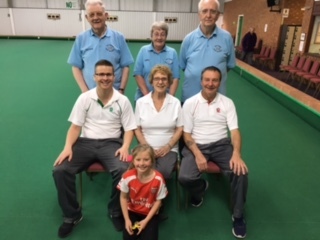 Their second game was against Island (Sheila and Roger Booker, Shirley and Phil Banner) where they won 9-3 and 5 ends to get 15 points. 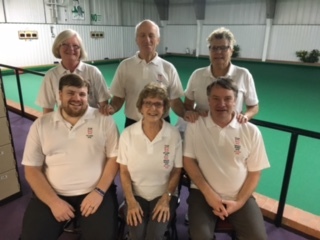 Their next game was against East Tilbury (Eileen Smith-Allen, George Christy, Pat Goodchild and Pauline Child) where they ran out 7-5 winners with 6 ends to give them 16 points. East Tilbury’s remaining 3 games gave them a win against Warren 17-0 and defeats against Springhouse 9-11 and Stonyhill 7-8. Going into their game against Warren, FOE needed to win 3 ends and win the match to be outright winners of the competition. This was never in question as they won convincingly 14-1 and winning 8 ends. 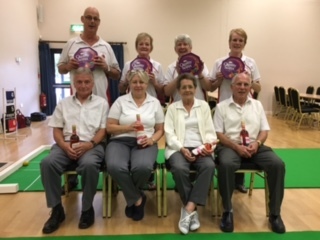 This gave them a total of 66 points with Sanguine (Teresa Kidd, Joan Southon, Brenda Neil and Barry Clarke) finishing in runners up spot on 60 points. Just to remind you all that all shirts are to be handed in to Brenda Neil by March 1st. All outstanding balances are to be paid by same date. Anyone who are going to hand payments to me personally I am away February 22nd to February 26th inclusive. Your shirts will be returned to you between March 20th and April 30th. It is with great sadness that Peggy Patterson passed away this morning ( 29/01/16) after not recovering from a recent stroke. 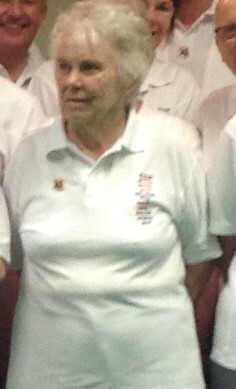 Peggy loved her bowling and represented FOE in many competitions and matches and also attended the annual tours. She played for clubs in Essex before moving to Clacton where she continued her bowling. She will be sorely missed and our thoughts are with Chris and her family at this very sad time. Latest update is that so far 13 teams have entered. Even though there is still some time to the event there are only 3 places available. If there is anyone who wishes to play and cant get five together please let me know. The entry forms for the May day bank holiday bonanza will be sent out shortly. THE ORGANISERS OF FRIENDS OF ESSEX SMBC WISH EVERYONE A HAPPY NEW YEAR AND A SUCCESSFUL 2016 AND ONCE AGAIN THANK YOU FOR YOUR CONTINUED SUPPORT. A return fixture has now been arranged for Sunday 15th May 2016 at Stonyhill. Please go to the relevant page from the menu for further details.